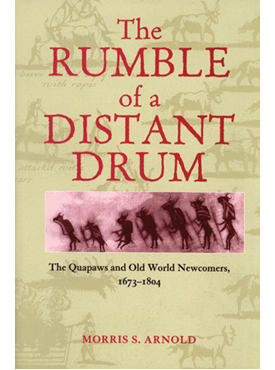 The Rumble of a Distant Drum opens in 1673 when Marquette and Jolliet sailed down the Mississippi River and found the Quapaw living in the area where the Arkansas River flowed into the Mississippi. In 1686 Henri de Tonti would found Arkansas Post in this same location. It was the first European settlement in this part of the country, established thirty years before New Orleans and eighty before St. Louis. Morris S. Arnold draws on his many years of archival research and writing on colonial Arkansas to produce this elegant account of the cultural intersections of the French and Spanish with the native American peoples. He demonstrates that the Quapaws and Frenchmen created a highly symbiotic society in which the two disparate peoples became connected in complex and subtle ways—through intermarriage, trade, religious practice, and political/military alliances. Morris S. Arnold is a United States Circuit Judge for the Eighth Circuit and a past winner of the state’s highest literary award, the Porter Prize. He is the author of a number of books, including the prize-winning Colonial Arkansas, 1686–1804: A Social and Cultural History and Unequal Laws unto a Savage Race: European Legal Tradition in Arkansas, 1686–1836.